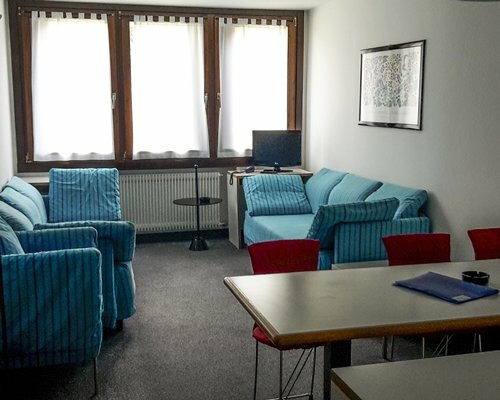 The Residence Rio Falzè is in the Passo Campo Carlo Magno, a few miles from the center of Madonna di Campiglio, the height of the ski paradise of the Italian Alps, and there is plenty of that sport to take advantage of if you desire. In summer, take advantage of hikes and walks in the beautiful pine forest amidst mountain vistas and stunning scenery. 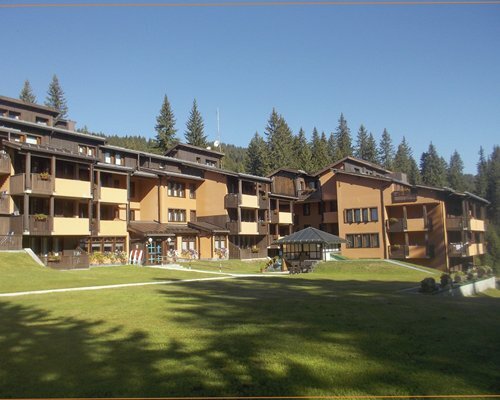 Onsite there is a bar, card room, adult club room, gym, and a ski school. You get special deals at local restaurants, and can luxuriate with a massage or sauna. 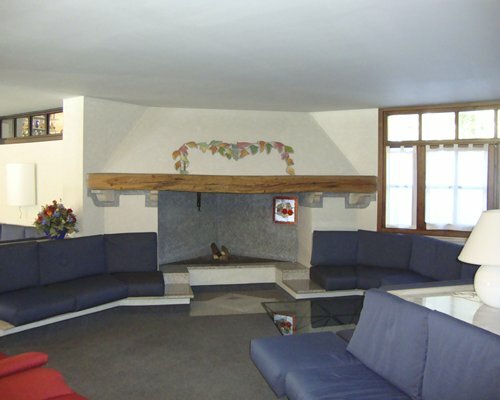 Relax by the warm fireplace after a full day of activity and fun. The apartments at the Residence Rio Falzè are perfectly suited to the beauty around them. Decorated in vibrant colors, the studios and 1- or 2-bedroom units have spacious living areas, full kitchens, and lush carpeting. 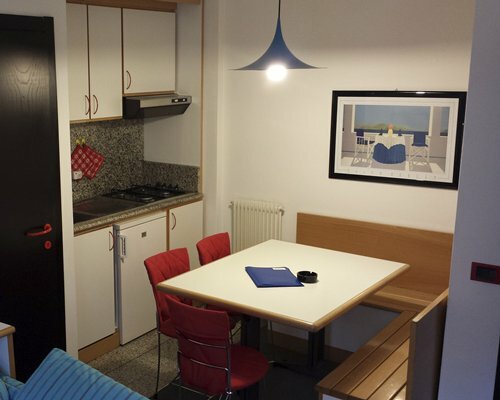 There are dining areas and living rooms, plenty of comfortable beds, with bunk beds for the kids, and lots of modern touches for your convenience. Best of all are the amazing views out the windows, with balconies overlooking the pine forest beneath you. 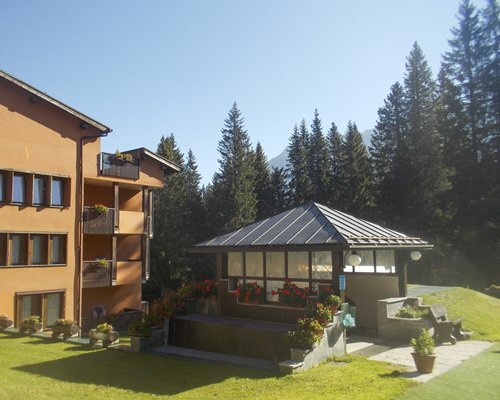 Residence Rio Falzè is in the beautiful Brenta Dolomites, on the outskirts of Madonna di Campiglio, a part of the World Cup ski circuit. The area has a rich history dating back to the Romans, with many influences shaping its culture. There are breathtaking mountain vistas that will stun your senses any time of year. In winter, there is world-class skiing and winter sports. In summer, you can go kayaking and rafting, and even summer skiing at Tonale Glacier just minutes away. There is golfing, tennis, fishing, hiking, and all kinds of unique area dining experiences. BY AIR: Nearest Airport: Venice (200kms), Milan (220kms) or Verona (140kms) BY ROAD: Take the motorway A4 to Verona, then change onto the motorway A22 towards Brennero and exit at Mezzocorona. Follow signs to Cles, Male and at Dimaro turn left towards Campiglio. The road that goes through Cles and Male is narrow and winding. It takes at least an hour from the motorway exit to the resort. 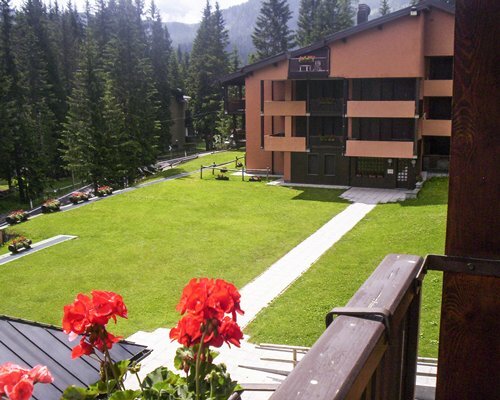 The resort is situated on Passo Campo Carlo Magno. BY PUBLIC TRANSPORT: take a train from Verona station to Trento. From Trento take a bus to Campiglio. Mandatory Tourist Tax per person per day is 0.70 Euros. Cash or Credit is accepted. Linens fee is 10.00 Euros. Cash or Credit is accepted.